Oftentimes when I’m in a rush to get ready, everything seems to go wrong. I end up spilling coffee everywhere, forgetting my wallet, or even accidentally locking myself outside the house. I don’t have anything that will keep my coffee in place or wallet by my side, but I do know a device that can prevent myself from being locked out, yet again. Instead of paying the local locksmith, I can download a new app called KeyMe. 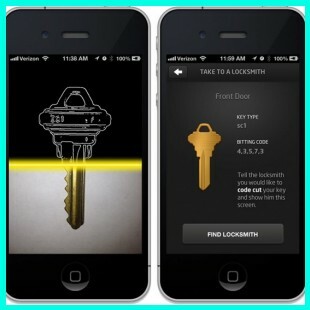 KeyMe is an amazing new app that scans keys front and back. In doing so, users save time and money, instead of having the locksmith do all the work. KeyMe allows users to store keys on their iPhone through the actual app itself. The stored key can be accessed at any KeyMe kiosk, shared with family members or ordered through the mail as a replacement. Just by simply placing the key on a flat white background, the app can begin to scan the front and back. One safety feature is that it only works on keys scanned with a white background. The reason is so someone cannot just take a random or oddly angled picture of the keys. Credit card information is also used to verify if the keys belong to the correct user. If going to a KeyMe kiosk, users also have to verify their keys via fingerprint. After scanning the keys, users can go directly to a locksmith to have the keys replicated! Awesome! Do you think this app would be useful? Let us know in the comments below or on Facebook or Twitter!